I think it’s time for us to occupy. Not going down and setting up tents out in front of city hall, but it’s time for us to be gainfully involved in boldly proclaiming truth and not backing down in the face of intimidation, whether it be from a school principal, kids if you’re listening obviously talk with your parents first, and parents, don’t be intimidated by school officials, don’t be intimidated by the ACLU. Um, Tony, you all already “occupy” a lot of places. That’s why gay kids end up getting the message from bullies and the fundamentalist religious leaders who enable them that they’re not worthy of living. I’d hate to see the bodycount if Tony Perkins stepped up the FRC’s “occupying” activities. Pastors, I’m gonna have a pastor hopefully on the program maybe this week or next week from Oklahoma who spoke out at city council and now he’s gotten death threats, well you know what, we’ve got to stand up to this. We cannot allow this to go on, allow them to intimidate us into silence. Should we be angry? No. But we should understand that it is the truth that sets people free and those in the homosexual community that are looking for fulfillment, that are looking for the approval that they are trying to get by forcing society to embrace homosexuality, they will never get it that way. They’ll only get it when they come to grips with the truth, that they are created in the image of God and God has a plan for their lives, and it’s not the destructive path that they’re on. Oh, so delusional. You see, people like Tony Perkins live in a weird, bizarre echo chamber outside of reality where the only thing they know and understand is their own lies. Just as creationists can look at fossils from millions of years ago and simply stick their fingers in their ears clinging to their cult belief that the earth is Brand New, Tony Perkins and his fellow anti-gay bigots [also creationists!] simply cannot compute the fact that there are millions of gay people who happy and fulfilled, and not on destructive paths at all. The truth of the matter is that it is those LGBT people who are most influenced by fundamentalist religion who end up destroyed. Their families end up destroyed, their lives are destroyed, sometimes they commit suicide…and for what? 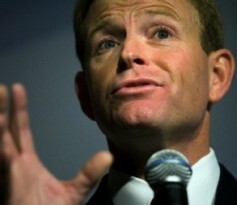 The approval of unworthy malcontents like Tony Perkins? My god.